19?? - Was born in Cachoeira, Bahia. 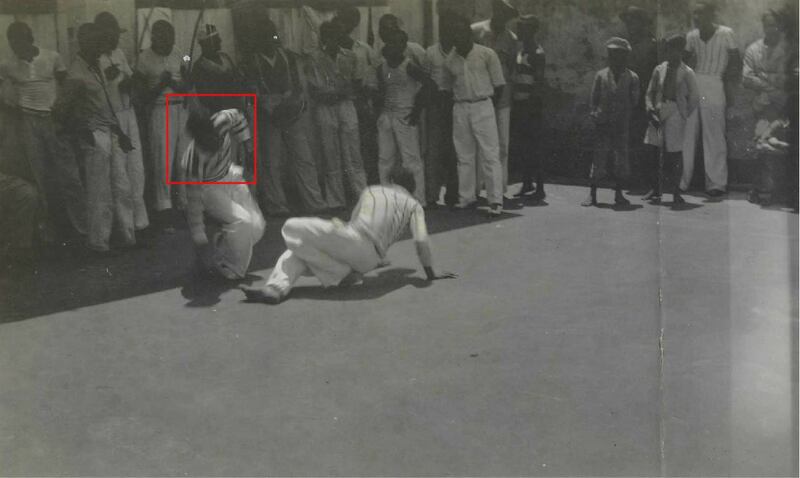 1937 - On the 14th January participated in a capoeira roda in the II Afro-Brazilian Congress in Ribeira, Salvador (see the photos below and read more here). The same year he appears in Edison Carneiro's book Negros Bantus as one of the informants of capoeira de Angola. As in the newspapers and in the book his name appears right after Querido de Deus, we can deduct his prominence. 1943/4 - Started to teach M João Pequeno in M Cobrinha Verde's academy in Chame-Chame. 1953 - M João Grande encountered him in a roda in Roça do Lobo in Salvador. * Cabeça Street, Dois de Julho neighborhood, Salvador. To write this book, I got the most efficient help [..] from Samuel "Querido de Deus", Barbosa and Zeppelin, when it comes to capoeira de Angola. [João Pequeno's] learning didn't start in an academy, but with a porter called Barbosa, from Dois de Julho Square, «who took me training and there was always a capoeira roda». «He [a work buddy] had a friend, who was a capoeirista, the deceased Barbosa. He was a capoeira mestre. That time the capoeira master was the one who taught, who has a capoeira roda. And there were only four people that time who were classified as mestres. These were Cobrinha Verde, who had a capoeira roda in Salvador's neighborhood called Chame-Chame. It was a neighborhood of mango trees. Waldemar da Liberdade had a roda, but it was on pavement, on the street. It was mestre Bimba who had a place for capoeira. And mestre Pastinha, who had his association, that was called the Sport Center of Capoeira Angola. «And then [the work buddy] introduced me to Barbosa, who was his friend. One day he called me, saying: «Lets go, Barbosa will be there! Lets go, I'll introduce him to you». He took me there and Barbosa, looking at me, asked: «You want to learn capoeira?» I at that time, having come from out of town, distrustful, said: «I do». And he said, looking at me: «Don't worry, you will learn capoeira». So since then I followed him. But he didn't have a place to teach in. We went to Cobrinha Verde's capoeira roda. He gave me a lesson and said: «Keep looking. Keep looking, because when you look you will see and learn». And so we went whereever there was a capoeira roda. I went to São Tomé de Paripe, because he has a capoeirista there who was a police captain called Chimba. We went there, to play capoeira at his place. And like this I was growing in capoeira». «Cândido had a friend called Barbosa, a porter, who worked on the market of the Dois de Julho Square. Looking for this friend I asked him to teach me capoeira». A life of capoeira. M João Pequeno, 2000. «[..] Barbosa from Cabeça, a porter, the capoeirista with the best technique that I've seen [..]». «I didn't see anyone play more than me. But I'll tell you the names of some who've already died: Barbosa, Onça Preta - this one is in Rio, old, but alive - Eutíquio, Gato Preto's father, Daniel played capoeira, but not only. [The deceased] Barboza, a porter of the 2 de Julho Square.